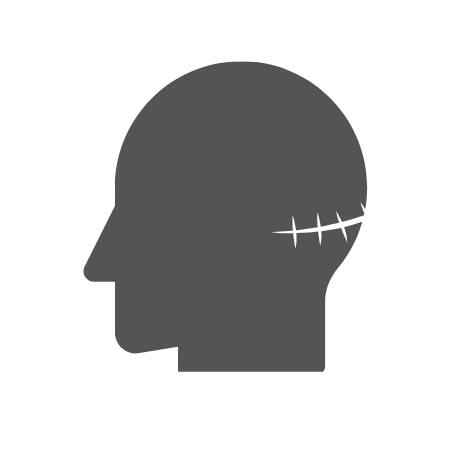 In this post we explain the types hair transplant scars Scalp Micropigmentation can fix. When you undergo any surgical procedure, you should expect some sort of scarring. This is also true when it comes to hair transplants. Unfortunately, the scarring may be more obvious and confidence affecting if the skin does not heal well, or if the operation did not go well. 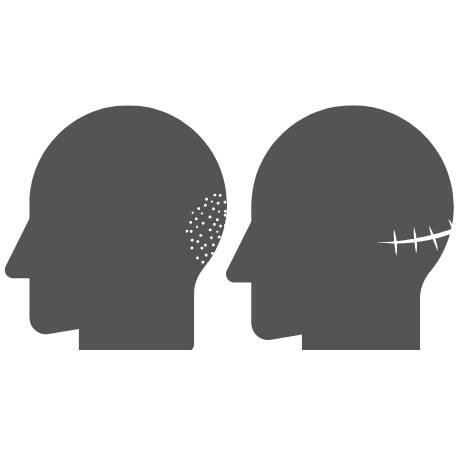 Scalp micropigmentation can help to conceal the scarring and help you get your confidence back. There are two main types of scarring hair transplant patients experience. 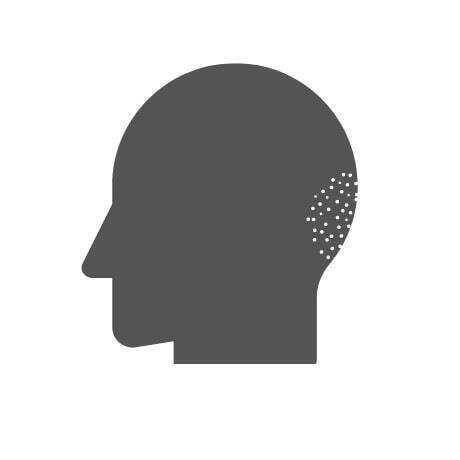 Below we explain how scalp micropigmentation treatment can help you. This method of hair transplant involves taking a large extraction of hair follicles. Many also refer to it as a strip method, and is usually the most common type of hair transplant performed. The surgeon makes a horizontal incision on the back and side of the patient’s head during the surgery. The hairs used in the transplant will be on a strip of skin that is about 20cm in length. These are then divided into smaller grafts featuring anywhere between 1-6 healthy hair follicles. After the operation, one of the main side effects of this procedure is the long scar that appears as a result of the skin extraction. If the patient experiences further hair loss in the same area, the FUT scars can become very noticeable. Scalp micropigmentation (SMP) uses a dynamic technique to apply pigment to the HT scar tissue to camouflage it. Practitioners will not only add pigmentation to the affected area, but also to the skin surrounding it. Some patients may decide to have the SMP treatment applied to their entire scalp if hair loss continues to occur in the treated area. FUE does not leave the same kind of obvious scarring as FUT, there can still be some white scarring found in the transplant area. These are usually small dots that appear between the remaining hairs. These type of scars are easier to manage with scalp micropigmentation. This is because they stand out less than strip scars, allowing a practitioner to blend it in with the surrounding skin. SMP can also be used as an undercoat to cover up their FUE scars. The practitioner matches the pigmentation so there is no clear difference, or they may choose to use a camouflage technique. There may also not be any need to shave any of the hair to achieve a good result. Of course, much will depend on your individual circumstances. Compared to undamaged skin, scarred tissue is far less predictable. It may take 2-3 sessions of SMP to fixing the FUE scarring, although in some cases it may take longer. The practitioner will be able to advise once they start work on the skin. Can You Cover Hair Transplant Scars With Scalp Micropigmentation? Yes! 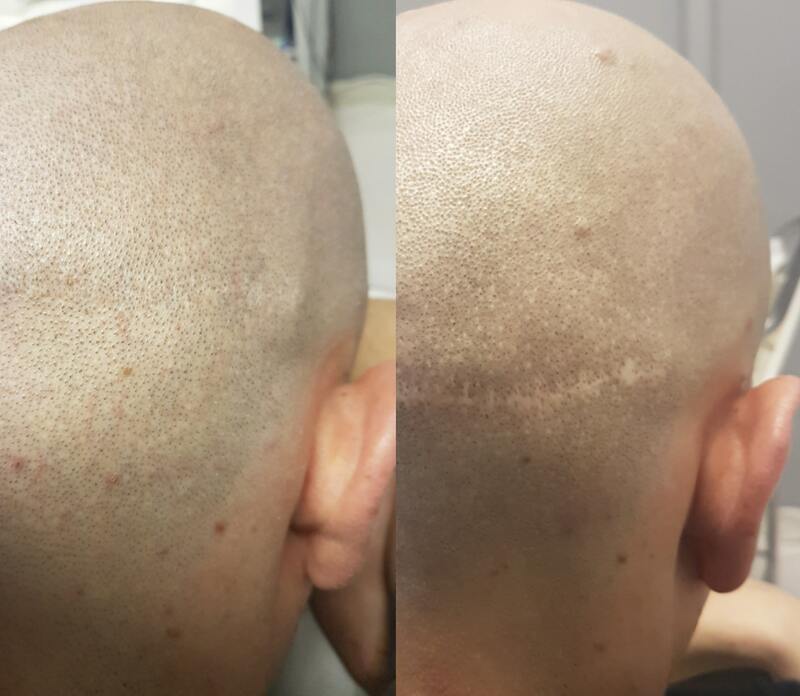 Scalp micropigmentation (SMP) is a fantastic treatment that can use a cosmetic tattoo to cover all scars including HT scars. Like in the example, Skalp® can expertly camouflage scarring so you can wear your hair as short as you like. Do you need help covering up hair transplant scars? We have helped countless men over the years to conceal scars they have received as a result of a hair transplant. Of course, everyone’s circumstances and scars are different. That’s why we offer a free consultation to all our customers. We are then able to take a closer look in person and suggest the suitable treatment. To find out more, upload a photo for a SMP treatment quote or call our team to arrange a free consultation.